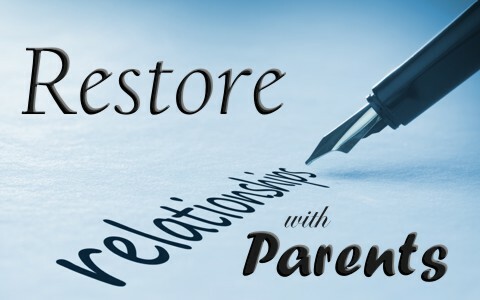 Here are 6 tips that I hope can help you restore a broken relationship with a parent. Exodus 20:12 says “Honor your father and your mother, that your days may be long in the land that the Lord your God is giving you.” Here is the first commandment with a promise and it is a promise of a long life. Paul repeats this commandment in the New Testament, testifying to the fact that it is very important to God, “Children, obey your parents in the Lord, for this is right. “Honor your father and mother” (this is the first commandment with a promise), “that it may go well with you and that you may live long in the land” (Eph 6:1-3). Those who do not honor their parents have no promise of a long life. This commandment is not conditioned on whether they were good parents or not. It does not depend on whether the parents are Christian or not. It doesn’t even qualify it as to whether the parents are Jewish parents or Gentile parents. It simply says “Honor your father and your mother, that your days may be long in the land that the Lord your God is giving you.” That is a command of God and this commandment, like the others, was written in stone by the very finger of God, indicating their permanence and was never a part of the Mosaic Law so tip number one is to simply obey this commandment. The first four commandments are vertical as they relate to our relationship with God. The next six are horizontal and deal with our relationships with others. Incidentally, when they are placed together, they form a cross. None of us had perfect parents but neither are we perfect parents. The point is not to honor parents that did a great job but to honor them despite the job they did raising us. If a relationship has been severed by the choice of the parents, a Christian should feel compelled to try and restore that relationship. Since Jesus commands us to love and pray for our enemies (Matt 5:44), how much more should we love and pray for our parents? We must humble ourselves before our parents and seek to restore this relationship. God is opposed to you and me if we are proud (James 4:6) so tip number two is to humble yourself before your parents, regardless of whether it was your fault or theirs in this severed relationship. We already read that Jesus commanded us to even love and pray for our enemies so we must pray and love our parents, even though we don’t feel like it. Who feels like going to the dentist? Even so, we need to. Going to the dentist doesn’t depend on whether you feel like it or not or whether you want or not; it is simply the right thing to do. Jesus never felt good about going to the cross, praying twice at least to have that cup removed (Matt 26:42), but He did it out of His compulsion to love and save us. Jesus said “If you love me, you will keep my commandments” (John 14:15), not if you feel like it or want too. This is actually a command from God as recorded by the author of Hebrews, “Strive for peace with everyone, and for the holiness without which no one will see the Lord. See to it that no one fails to obtain the grace of God; that no “root of bitterness” springs up and causes trouble, and by it many become defiled” (Heb 12:14-15). The idea of removing all bitterness shows that it takes effort and is a predetermined action required by the person. They should not remain bitter about their parents, no matter what they did. They must remove that root of bitterness and the root cause may be what the author of Hebrews is talking about. What is that root? It might be a harshness that the father showed you or your father may have abandoned you or it might even go back to one experience or event in your childhood. When I was pulling weeds the other day in my yard, I had to wait for the ground to be moist before I could pull the weeds out, otherwise the root would be left behind and it would come back again, perhaps even stronger. We have to dig deep and the soil and our hearts must be softened in order to get the whole root from springing back up again. Soft soil allows a root to be pulled; hard soil cannot get to the root. The same is true of the human heart. Soft hearts are pliable and workable but hard hearts are nearly impossible to work with. So tip number three is to soften your heart and you probably will need God’s help in this. “Pursuing peace” means you have to make a concerted effort. When Peter asked Jesus how many times must we forgive our brother, supposing that seven times was more than enough, Jesus corrected Peter by saying “I do not say to you, up to seven times, but up to seventy times seven” ( Matt 18:21-22). That “seventy times seven” is not 490 times but a limitless number. Jesus warned the disciples and He warns His followers today, “But if you do not forgive others, then your Father will not forgive your transgressions” (Matt 6:15). How much more have we been forgiven by God than we could ever forgive others in a million lifetimes? The number of our sins is of infinite measure but God has wiped our slate clean in Christ. Should we not do the same for our parents? Tip number six is to just be thankful for all things in life and that includes being thankful to and for your parents. We might not realize how they were raised by their parents. Perhaps their parents were even harsher than yours were. Why not thank your parents for the job they did, as imperfect as it was, to show that you didn’t expect them to be perfect, only perfectly forgiven. How can we judge our parents when we don’t know what they went through as a child? They too are a product of their upbringing. They likely had great issues with their own parents. They probably did the best that they could, given what they knew at the time. Even if they did a poor job, we should give thanks to them because “we know that for those who love God all things work together for good, for those who are called according to his purpose” (Rom 8:28). God was not caught off guard. He knew what we went through so be thankful for them, regardless of how good or how poor of a job they did. I hope you can restore your relationship with your parents for by doing so, you are being obedient to God; you are humbling yourself; you are obeying the command to love; you are removing the root cause of the bitterness you have; you are forgiving them as you’ve been forgiven much; and you are being thankful which is most pleasing to God.